Journal of Library and Information Sciences is a peer-reviewed international journal published by American Research Institute for Policy Development. The target audience of the journal includes librarians, information scientists, specialists, managers and educators. The journal aims at publishing the research papers with the most recent issues and developments in the field. All papers are subject to a double-blind reviewing process. It is particularly interested in the intersection of librarianship and publishing and the resulting role of libraries in both content dissemination and content creation. 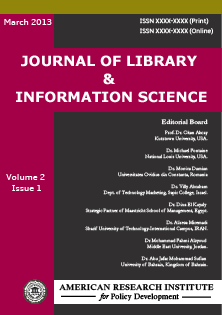 Each paper published in Journal of Library and Information Sciences is assigned a DOI®number, which appears beneath the author's affiliation in the published paper. Click HERE to know what is DOI (Digital Object Identifier)? Click HERE to retrieve Digital Object Identifiers (DOIs) for journal articles, books, and chapters. Prof. Dr Vaishali Khaparde, Dept. of Library and Information Science, Dr Babasaheb Ambedkar Marathwada University, India. Dr. Cheruiyot Cosmas Kemboi, Deputy University Librarian, KCA University, Kenya. Dr. Henry D S Kinya, Dept. of Library and Information Science, Africa Nazarene University, Kenya. Dr. Aybike Serttas Ertike, Arel University, Istanbul, Turkey.